Handbrake won't remove encryption on the latest macOS 10.13/14 any more. How to get rid of this problem or do you have any other good ripper to rip protected DVDs on macOS Mojave? I want to rip encrypted DVD to MP4 on Mac with minimum quality loss. Any help? The latest macOS has delivered various exciting new enhancement for Sira, Apple File System, Photo, Maps, Mail, etc, it also disables the abilities of various tools like Handbrake. Luckily, many other DVD decrypters works perfectly on macOS 10.13/10.14 survive. 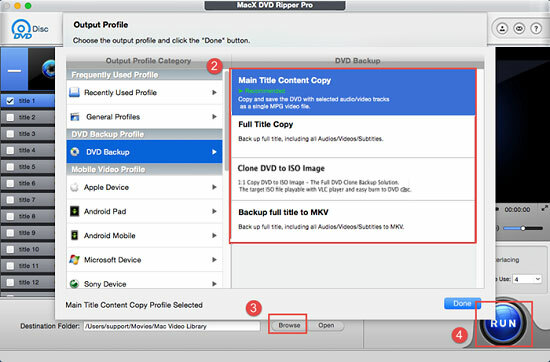 If you have trouble to decrypt DVD on macOS High Sierra/Mojave, like those produced by Disney, Paramount etc, worry no more, here we list the best protected DVD rippers for macOS High Sierra/Mojave to help you rip those protected DVD to MP4, ISO, AVI etc with high quality. The first protected DVD ripper for macOS High Sierra/Mojave we recommend here is MacX DVD Ripper Pro. This DVD decrypter fully supports macOS Mojave to rip any protected DVD with encryptions like CSS, Region Code, Disney X-project protection etc, and it will be constantly updated with the latest copy protections. It offers various output options to allow users to rip encrypted DVD to MP4, ISO image, MKV, MOV, FLV, AVI and may more, be it from Disney, Paramount, 20th Century Fox or other companies. The whole DVD decryption on macOS High Sierra/Mojave will be done in 5x faster speed with nearly no quality loss. Many users complained that Handbrake won't rip DVD with protections, so why it's recommended as a protected DVD ripper for macOS 10.13/10.14 here? Well, if you find that your Handbrake won't rip encrypted DVD on macOS HighSierra anymore, check the Libdvdcss and reinstall if necessary. After that, you will find that it works well like before. It will rip protected DVD on Mac to MP4(.M4V) and .MKV as good as it usually does. But some other encryptions like Disney 99 titles are out of luck, which means that you can't rip all movies from Disney with this macOS High Sierra/Mojave DVD decrypter. As another good DVD decrypter software for macOS Mojave/High Sierra, Any DVD Cloner Platinum for Mac provides one-stop solution to rip encrypted DVD to MP4, MKV and M4V and removing DVD copy protections like CSS, RC, RCE, APS, UOPs, ARccOS, etc. It features a useful function to rip protected DVD to DVD, DVD folder or ISO image for easy backup. The output format options are limited, but it does a good job to rip protected DVDs on MacBook Air/Pro, iMac, with acceptable speed and quality. MakeMKV is a famous yet free protected DVD ripper for High Sierra/Mojave to convert encrypted DVD into MKV files. It supports Blu-ray discs and DVDs protected with latest version of AACS and BD+. The decrypting speed is fast, and the output MKV file with all video, audio tracks, HD audio included is in good quality, but pay attention to the large size (16GB of a decrypted movie). For those who would like to convert DVD to the high-quality MKV on Mac, MakeMKV is no doubt a good candidate for DVD Decrypter for macOS Sierra. Aimersoft DVD Ripper is another powerful DVD decrypter that works on High Sierra and Mojave. It can easily rip encrypted DVD on macOS Sierra with protections like CSS, Region, RCE, Sony ARccOS and PuppetLock. It allows users to convert protected DVDs to MP4, AVI, MOV, MKV, 3GP and many more for playback on mobiles with no sweat. It also guarantees fast speed to rip any encrypted discs on macOS 10.14 or earlier, and the output video quality is also quite good. It therefore stands as a good protected DVD ripping tool. Below we will show you how to rip protected DVD on macOS Sierra based MacBook Ari/Pro, iMac with the above protected DVD ripper for macOS Mojave. Here we take MacX DVD Ripper Pro as an example. Step 1: Free download DVD decrypting software on Mac and run it. Click "DVD Disc" to load the DVD, you can also import DVD folder or ISO image saved on your computer. Step 2: Choose the format you'd like to decrypt the DVD to. For example, you can rip encrypted DVD to mp4, mov, 3gp etc, or to iPhone X/8/7/7 Plus, iPad, Samsung as you like. Step 3: Click the "Browse" button to set a folder to save the decrypted movie. Step 4: Click "RUN" to start rip protected DVD on Mojave/High Sierra. The ripping process will be superfast. Note: Having trouble to rip DVD protected by Disney, CPRM, Sony? Choose Safe Mode at the lower right corner and this protected DVD ripper for macOS 10.14/10.13 will continue to hand the protected movies smoothly.